Sixty-two percent of Los Angeles residents fail to use all their vacation time – the second-highest percentage in the country next to only Washington, D.C. and the Bay Area, where 64 percent of workers don’t use all their vacation. The Automobile Club of Southern California, in collaboration with Project: Time Off, knows the most effective remedy for workers who want to use more vacation days is better planning, so it is supporting National Plan for Vacation Day on Tuesday, Jan. 30. Leverage your AAA exclusive member discounts for car rentals and hotels, as well as exclusive member benefits on cruises and other travel packages. Consider booking vacations with a travel agent. AAA has travel agents at all their branch locations. In addition to having in-depth expertise about destinations across the globe, AAA has relationships with most major travel suppliers, including cruise lines, hotels and tour operators and often negotiated special rates and added benefits for AAA members that are not available elsewhere. 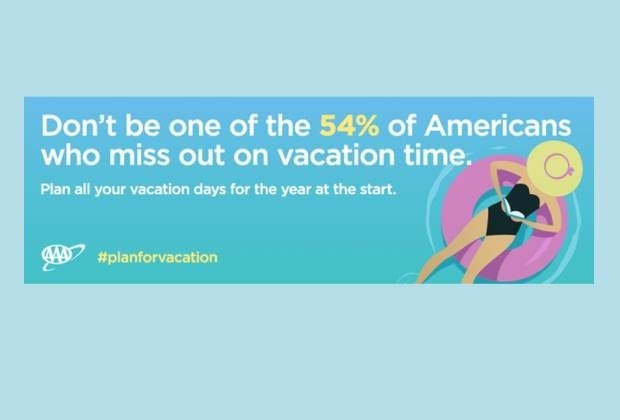 In addition to AAA’s tips, Project: Time Off offers a vacation-planning tool to help employees get their vacation days on the calendar. The decision to travel is a very personal one that must be made by the traveler. No matter where you go, always remain informed of travel alerts and consult a travel agent for their expert advice. AAA travel agents are available to assist members with this information. Travelers can get started planning their next vacation at their closest AAA branch. You can find a AAA location near you at AAA.com/office.